U.S. manufacturers expanded for the 19th consecutive month in March, although at a slower pace than the 14-year high set in February. Purchasing managers surveyed for the ISM Manufacturing Index reported that of 18 industries surveyed, only apparel didn’t grow during the month. Amid growth, survey respondents said they are experiencing increasing constraints from supply chain and lack of workers. The Commerce Department said construction spending hit an annual rate of $1.27 trillion in February, the 17th month in a row above the 2006 peak. The pace was up 0.1% from January and 3% ahead of the year-ago pace. A rise in single-family housing helped lead the gain, which could further fuel the housing expansion by building inventory. The annual sales pace of motor vehicle sales rose in March for the first time in three months, reaching 17.5 million, up 2.4% from February and up 3.9% from the year before. Sales of trucks continued to outpace cars, according to manufacturer reports gathered by Autodata Corp. For the month, the rate of domestic car sales rose while imports declined, but year-to-year, domestics increased 2.6% vs. a 9.1% gain for imports. Economists watch auto sales as a measure of consumer spending, which drives about 70% of U.S. economic activity. In a sign that manufacturing continues to advance, the Commerce Department reported that factory orders rose 1.2% in February, the sixth gain in seven months, staying 7.9% above year-ago levels. Excluding the volatile transportation equipment category, orders increased 7.5% from February 2017. Orders for non-military capital goods excluding aircraft rose 1.4% for the month and 7.3% from the same time last year, suggesting further comeback in business investments. At a slightly slower pace, service-sector businesses expanded in March for the 98th month in a row, according to the Institute for Supply Management Non-Manufacturing Index. The largest segment of the U.S. economy is suggesting that the nation’s gross domestic product is expanding at a 3.6% annual rate, the purchasing managers group said. The rate of increase declined for the second month in a row after hitting a 12-year high in January. 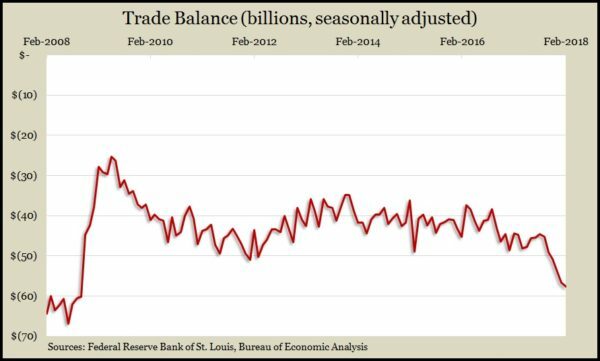 The U.S. trade deficit expanded 1.6% in February as the value of both exports and imports rose by 1.7%, according to the Bureau of Economic Analysis. The $56.7 billion gap was the widest since the financial crisis in the middle of the Great Recession and marked a 22.7% expansion since February 2017. In the last year, exports grew by 5.9% while imports increased 9.1%. The moving four-week average for initial unemployment claims rose for the fourth time in five weeks since hitting its lowest level since late 1969. The measure remains 36% below the 51-year average, which it has been below every week since early 2013, according to Labor Department data. The persistently low level of jobless claims is evidence that employers are reluctant to let workers loose amid a tight labor market. Employers added a lower-than-expected 103,000 jobs in March, making a record 90th consecutive month of payroll expansion, according to a report from the Bureau of Labor Statistics. Revised estimates showed employers adding 50,000 fewer jobs in January and February than previously reported. Average wages, which analysts have been watching as a sign of nascent inflation, rose 2.7% from the year before – still a tepid rate, considering strong hiring conditions. The bureau’s separate survey of households estimated unemployment at 4.1% of the labor force for the sixth month straight – the lowest rate since December 2000. Consumers showed little nerve for extending credit in February as credit card use rose at the lowest rate since 2013. The Federal Reserve Board said so-called revolving credit outstanding increased 0.2% in February, vs. 4.4% for non-revolving credit, which includes student loans and automotive financing. Together, the amount of consumer credit outstanding grew by $10.6 billion, but credit cards accounted for less than 1% of the difference.